Lush Christmas Collection - My Top Picks! As Lush lovers will no doubt be aware, the brand's hotly anticipated Christmas offerings went on sale this weekend. They've been on a roll recently with their fab new makeup line and, most recently, the launch of a brand new range of hair products (which I reviewed over on beaut.ie if you want to take a look). So I was expecting good things from their seasonal selection - and they didn't let me down. Like always, there really is something for everything with the underlying theme being one we can all get on board with: fun! From cute little stocking fillers at €4.95 to humungously big gift sets for €100 plus, there's something here for every taste and budget. The range is so extensive that you'll really have to pop in store for a wee look-see of your own, but in the meantime here's a peek at my top picks. They're all limited edition so if you love them, you're gonna want to stock up! A Christmas best seller, Snow Fairy has legions of devoted fans who love it for its sparkly, candy floss scented ways. 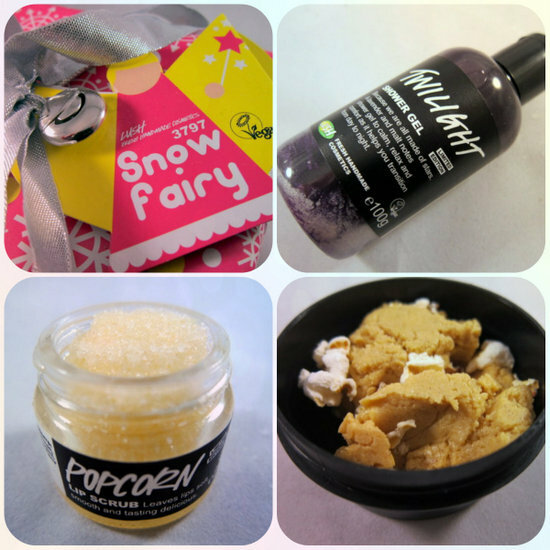 This wee kit comes with 100g of Snow Fairy shower gel, a shimmy shimmy massage bar and Angels Delight star soap. It will fly off the shelves. Last year I tried and fell for the seasonal Bûche de Noël cleanser (also back this year; smells just like Christmas pudding!) but this one could, I think, be even better! Looks and smells like my most favourite thing in the world - buttery caramel, mm hmm mmmm.... Sorry I got distracted there for a second. Give this a sniff, you won't be sorry. Oh and does a lovely job cleansing and exfoliating, too! I am a massive fan of lip scrubs from Lush; they're brilliant for banishing dry flaky wintery patches which makes my lips feel great and my lipstick look a million times better. This latest variety tastes like popcorn and could be my favourite yet. A handbag must-have. Laden with lavender, this one is one of Lush's most grown up products but that doesn't mean it's boring - far from it. Based on one of their bestselling bath bombs, Twilight is deeply relaxing and a great one to use at night. What are your must-have products from Lush? Oh, and pssst! If you're a fan of the brand, make sure you check back to the site this afternoon - just sayin'! You can also check out the full range of Christmas offerings online. Yay, I love Snow Fairy! Also I really want to try the new lip scrub and caramel face srub, hopefully we get it all here in aus!! I need them all. I literally an going to buy everything you reviewed. The lip scrub sounds good enough to eat!!!! Snow Fairy & Twilight are beautiful. The Northern Lights soap too. I spend way more than I should in Lush at Christmas. I shop for gifts and then can't give them away... It's a problem lol. The facial cleanser looks like ice cream! Love it. Would you believe I'm just at the end of my Bûche de Noël now (i know there is a use by but mine was fine!) OMG totally buying the christmas one! I want a bubble beard too and the midnight massage bar, it's like a melting dali clock! I love lush! My go-to soap I think was called snowflake, an almondy delicious one! You have just reminded me I should stop into my local store asap! Hope you're having a beautiful day! I love the snow fairy scent, heading for this at Xmas! The lip scrub looks fab. I am loving Lush! Lush is great for sweet little stocking fillers...stocking fillers aarrrgh! How can Christmas be so close?! Oh wow I was just wondering yesterday what Lush would bring out this Christmas. I am so excited.